This entry was posted in A Postcard from Undina and tagged Halloween. Bookmark the permalink. Thanksgiving food always looks so good! Have a very happy Thanksgiving Undina. Looks SOO Yummy. I wish i was siting down to chow with you. We’ll do it one day. Maybe not for Thanksgiving but it will be tasty. Happy Thanksgiving! 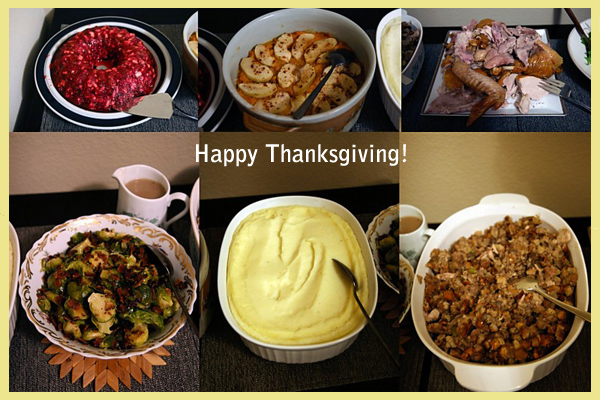 It’s hard not to like a holiday that focuses on be thankful for what you have and really good food. Enjoy your day! Thank you! It was a good day. Happy Thanksgiving, Undina! What California wine are you breaking out for the big feast? Or better yet, what perfume will you be wearing? I’m going with Arabie. Cheers! We had wines from our two favorite wineries 2006 Paradise Ridge Elevation Rockpile Vineyard Cabernet Sauvignon and 2007 Cabernet Sauvignon clone 337, Alexander Valley. And for my perfume I wore 2005 La Collection Lancome Climat. Happy Thanksgiving Undina I am so thankful you are here with us to enjoy this day… And thankful I have met you. Thank you, Lanier – for all the nice words (on different blogs :) ). Happy Thanksgiving Undina! Your food looks great. Thank you, Susan. The food was really good (these pictures were from a couple of years ago but this year everything was also very good). Happy Thanksgiving! That stuffing looks tasty. Thank you, Kay! It was extraordinary (I didn’t cook it so I can compliment it all I want)! Looks delicious – glad you enjoyed the day!